Nitrous Oxide, aka; N2O, Juice, throttle in a bottle, spray, squeeze, and of course nos. Nitrous is by far THE most cost effective / biggest "bang for the buck" power adder there is, but this mysterious substance has a nasty reputation for melting down and eating-up engines. Once you know the in's and out's, Nitrous isn't such a bad thing after all, especially when it's set-up correctly. This double DVD set is packed with almost 4 hours of great information. 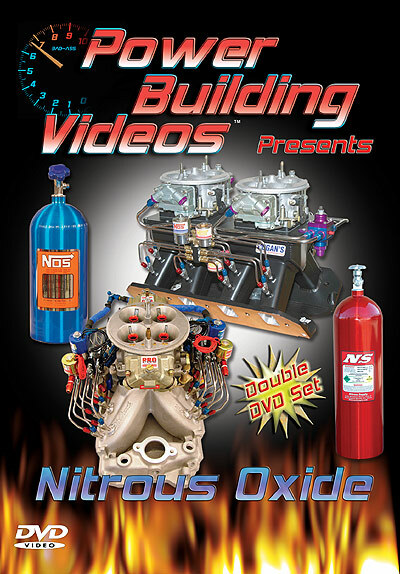 It takes through everything you ever wanted to know (and then some) about Nitrous, how it works and how to build your engine and set it up so it will RELIABLY handle this great substance, (both on the street and at the track). You'll be taken through several brands and numerous types of systems for both carbureted and EFI engines, from little 20HP "cheater" systems to giant 600 HP dual stage fogger systems. You'll also learn about electronics, ignition systems, fuel system upgrades, tips on tuning and jetting and much, MUCH more! An added bonus in this show are interviews with some of the founding legends of Nitrous Oxide, who give their extensive insight on this awesome substance directly to YOU. If you're into nitrous or are just curious about it, you don't want to miss this show! KNOWLEDGE IS HORSEPOWER! Be sure to click the link below to see preview clips of this title.